Whether you have a cold or you've just stepped off a cross-country flight, you feel one symptom--your ears are plugged. While this is not a serious condition, it is uncomfortable and it makes it inconvenient when you need to hear what others are saying to you. Your ears get plugged during a cold or a flight because your eustachian tubes become obstructed. When this happens, your eardrums can't vibrate they way they're supposed to, resulting in the feeling of pressure and your decreased hearing ability. Squeeze some nasal decongestant into both nostrils. This might help you unplug your ears, according to Consumer Reports Health. Yawn or swallow frequently so you can equalize the pressure between your ears and the air outside your ears. If this doesn't help, try chewing gum. The chewing action helps make your ears "pop" so you can get rid of the pressure and muffled hearing, according to Consumer Reports Health. Take a dose of an oral decongestant. As the medication takes effect, it may help relieve the pressure you feel in your ears, according to the Mayo Clinic. Unblock your eustachian tubes by plugging your nose and blowing out. If you hear a pop, you've unplugged them, but be careful not to blow too hard. If you do blow out too hard, you might perforate your eardrums, according to Consumer Reports Health. If you fly with a baby, make sure you give her a bottle as your plane is taking off. Sucking on the bottle and swallowing the water or formula helps her to combat airplane ear. If your condition lasts longer than a few weeks, visit your doctor, according to the Mayo Clinic. Don’t fly when you have a respiratory infection or a cold--this increases the risk of ear problems, according to Consumer Reports Health. Consumer Reports Health: Q&amp;A: Relief for Airplane Ear? 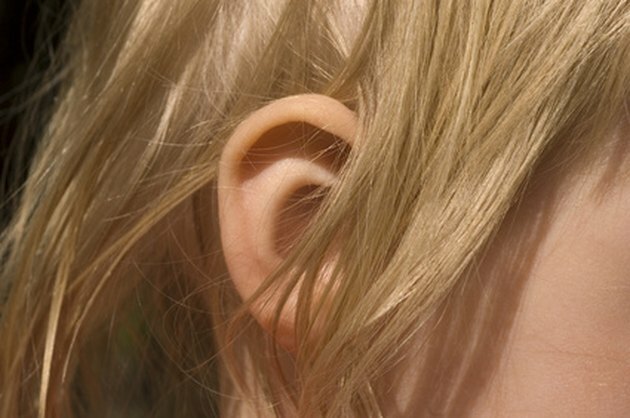 What Are the Dangers of Ear Infections?